It was an afternoon I would never forget. 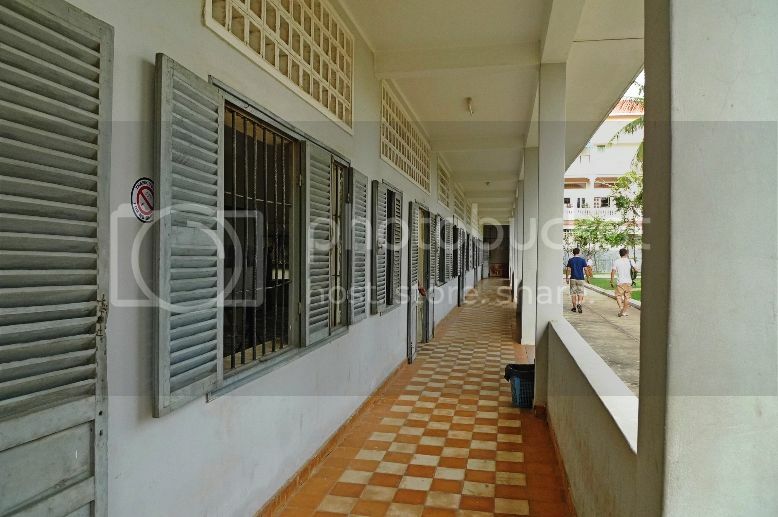 After our lunch and a visit to the Russian Market, our good friend and host brought us to the infamous Tuol Sleng Genocide Museum in Phnom Penh. 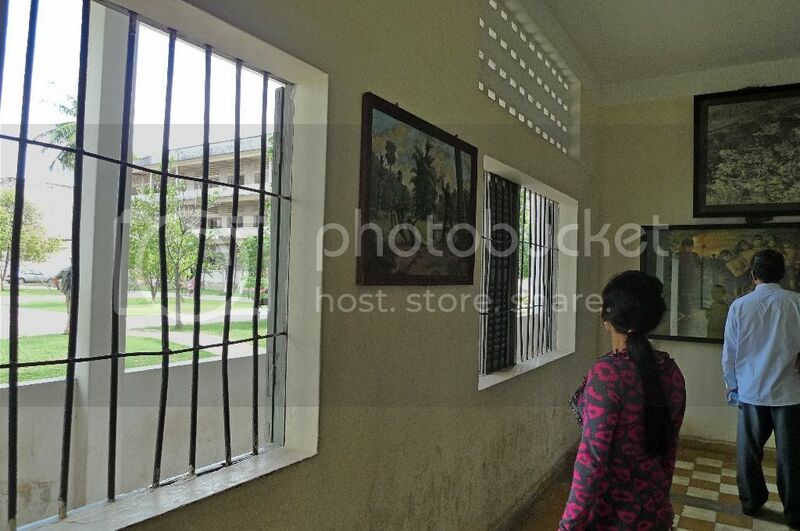 If it does not look like a museum to you, that's because it was formerly a high school but was converted into a prison and interrogation centre by the Khmer Rouge communist regime from 1975 to 1979. Widely known as Security Prison 21 (or S-21) at that time, this is the place where an estimated 20,000 people were imprisoned and tortured. Tragically, out of this number, there were only 12 known survivors to date! The S-21 is now a Genocide Museum which also serves as a memorial to those who died. It is open to the public and receives about 500 visitors a day. Prior to this visit, I had very little knowledge about this dark side in the history of Cambodia. I have heard about Pol Pot and the Khmer Rouge regime but they did not make much of an impact on me NOT until I visited this place. Our good friend who had brought us here had firmly refused to accompany us inside, citing reasons ranging from 'traumatic' and 'nightmares' to 'haunted'. That however, did not deter us. Being first time visitors to Phnom Penh, we knew we just had to visit it. Before entering the building, I saw this warning notice outside. DO NOT LAUGH. 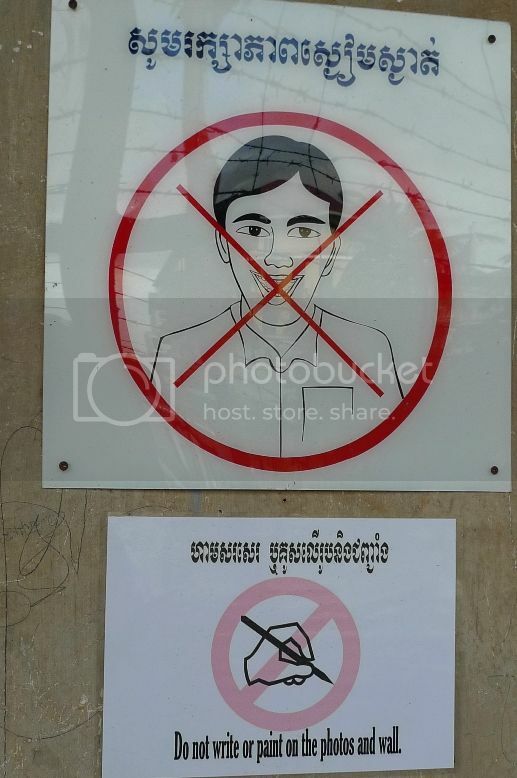 DO NOT WRITE OR PAINT ON THE PHOTOS AND WALL. It surely set a sombre tone for the rest of our tour. 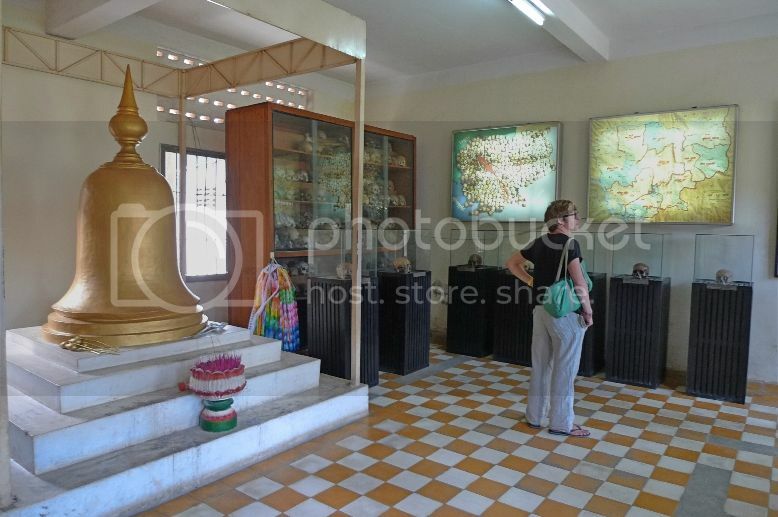 Upon entering, I saw a stupa encased in glass and a cabinet filled with human skulls of the victims. I am sorry I had deleted all the close shots of the skulls as I had felt uncomfortable with the pictures in my camera. If you wish to look at some pictures of the skulls from the Internet, you may want to click HERE and HERE. Now if you are not very familiar with the genocide tragedy that happened in Cambodia, let me tell you very briefly, the horror story that had made a deep impact on me that day. After Khmer Rouge led by dictator Pol Pot, took over the previous government in 1975, they intended to turn Cambodia into a self-sufficient, classless society. Schools, hospitals, factories and banks were closed. Finance and currency were removed. Families were broken up and people were uprooted from their homes. Major cities were completely evacuated with the entire populations sent to working camps. Those who were rich, popular, or well educated (or perceived to be educated) who had the slightest ability to undermine the new regime were taken to torture camps and prisons where they were forced to confess to treasons, resulting in execution. 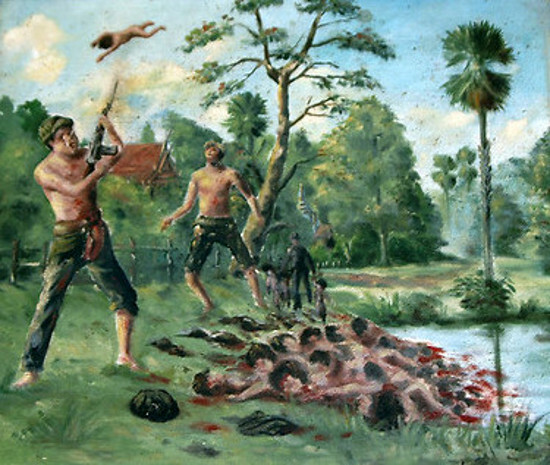 Khmer Rouge was responsible for the deaths of over 2 million innocent Cambodians over a period of 4 years. That was almost one third of the entire population in Cambodia! The death toll could have been higher if not for the Vietnamese Army which invaded Cambodia and toppled the Khmer Rouge in 1979. 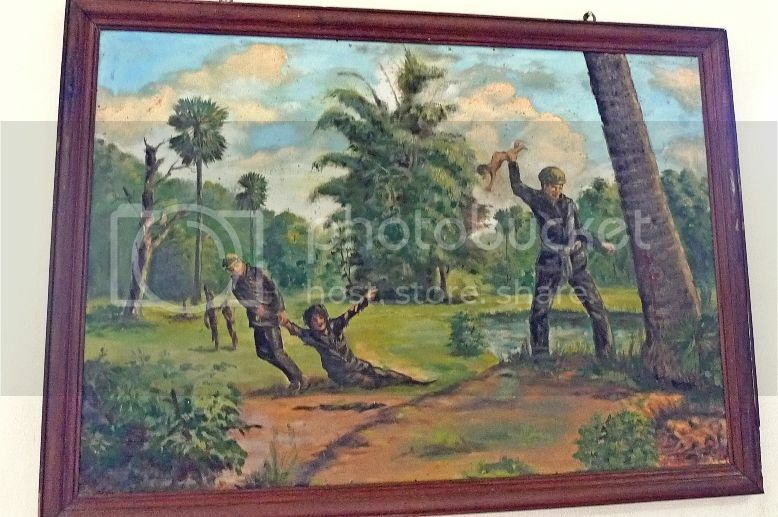 Walking inside the Genocide Museum, I saw many paintings on the wall showing victims being tortured. 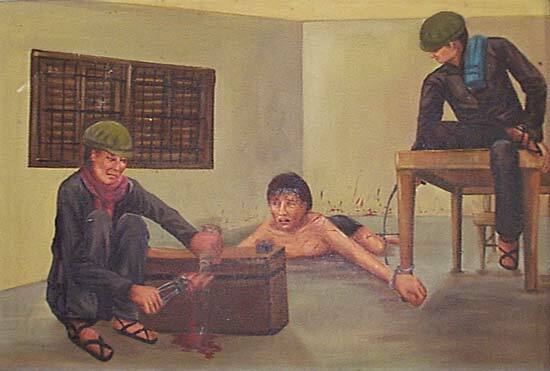 These paintings were painted by Van Nath, a survivor of the S-21 atrocities. He was spared because of his drawing skills. I did not take many photos of the paintings. Most of them were gruesome depictions of the horror and suffering that the victims had to endure. Prisoners were routinely beaten and tortured with electric shocks, searing hot metal instruments and hanging. Other torture methods include sleep deprivation, starvation, suffocation with plastic bags, heads held under water and waterboarding. There was one picture that showed a prisoner with his fingernails being pulled out while alcohol was poured onto the wounds. Oh my God! The cruelty was beyond comprehension! How could any human being do this to another fellow human being? I was shocked. 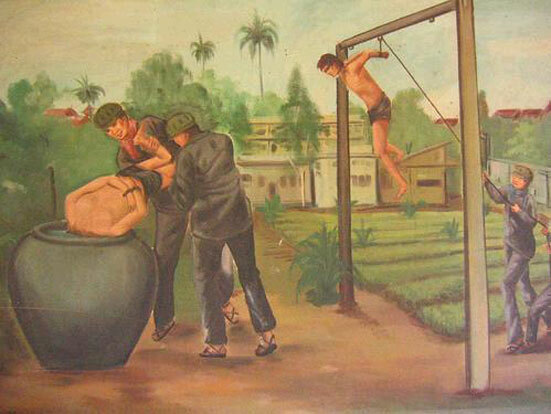 Besides, most of the prisoners were ordinary Cambodians, not criminals and they were tortured simply to extract confessions to crimes they did not commit! I managed to take a photo of one of Van Nath's paintings. It shows a baby being snatched away from her mother - both probably ended up being killed mercilessly. It was heartbreaking. I could not bear to take photos of the other paintings, but for the benefit of my readers, I have decided (although very reluctantly) to post some of the pictures I found from the Internet below. 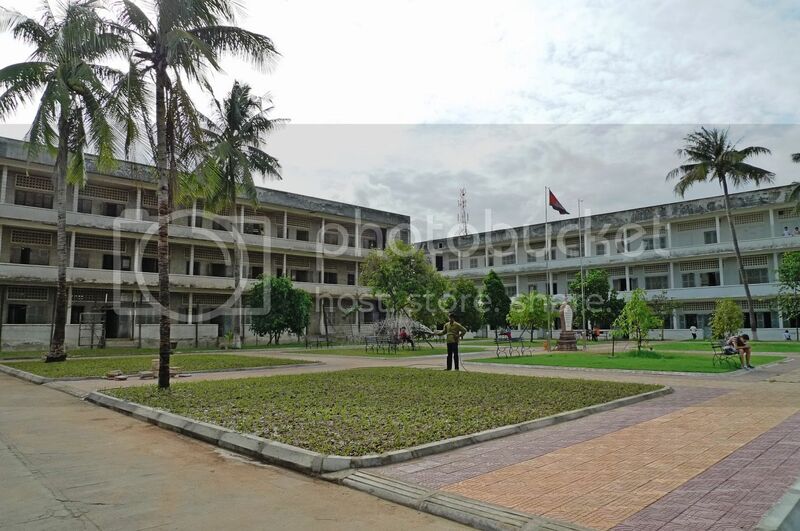 In a diabolical attempt to eliminate all those that were considered a threat to the Khmer Rouge government, the prisoners were forced to name relatives, colleagues, friends and even acquaintances in their confessions. These people who were named would then be arrested and sent to S-21 for interrogation. Those who had confessed would then be taken outside and killed. During the first year, the killings took place at the prison, but when there was no longer enough burial space left, they were taken to Choeung Ek, a killing field 15km away. There, they were killed using iron bars, pickaxes, machetes or other makeshift weapons and buried in mass graves. The paintings alone had already left a deep impact on me. But as we toured the building, checking out the torture cells, looking at thousands of photos of the victims and reading their stories, I suddenly felt down, very down. 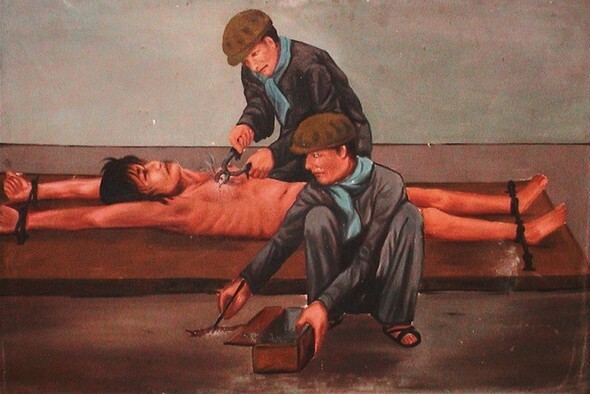 The full horror of the senseless Khmer Rouge killings had only began to sink in.